A murderer who attacked a man with a hammer has been sentenced to a minimum of 18 years in prison. Mitchell Bird "viciously" hit and kicked Bradley Carter after the pair had been taking Class A drugs together for more than 30 hours. Mr Carter, 35, died of his injuries in hospital five days after the assault on 14 February. 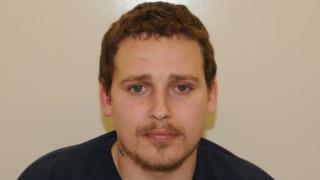 Bird, 30, of Cox Close, Wisbech, was found guilty of murder last month. Sentencing at Cambridge Crown Court, Judge David Farrell said the death "demonstrates the evil of class A drug use". The court heard how Bird let Mr Carter into his home after the victim had been thrown out of his mother's house for taking drugs. After more than a day of taking drugs together, Bird believed Mr Carter was trying to steal the keys to his flat. He then hit him in the legs with a hammer, causing him to fall to the ground, where he "cowardly and viciously kicked him while he lay defenceless". Mr Carter later died at Queen Elizabeth Hospital in King's Lynn, Norfolk, with a spleen haemorrhage. His mother Helen Barnes said "there is nothing I can compare the heartache to and I would not wish this on anybody". Bird, who had denied murder, was convicted on 6 September.